For more than 60 years SOLA brand marks perfect precision measuring tools. As experts on measuring and marking SOLA manufactures a wide range of products supporting craftsmen on construction sites. It is their approach to develop and continuously optimize the products as close as possible to their customers’ requirements. Characterized by consistent simplicity, efficiency precision SOLA innovations are setting the standard in many applications from civil engineering to interior construction. As the Austrian market leader in premium spirit levels SOLA provides a versatile product range, including rules, screeding levels, long and short tapes, squares, marking products, laser distance meters and a customized laser program. The SOLA brand is globally present in 70 countries. 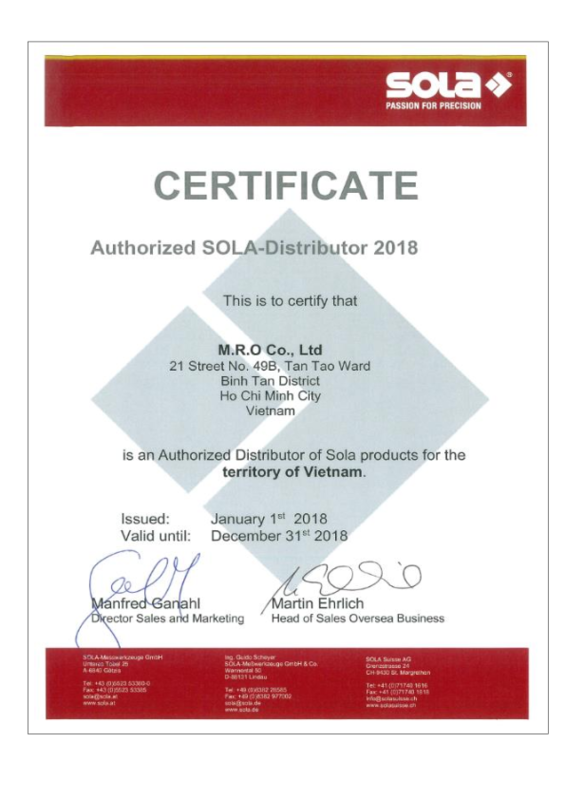 In Austria, Germany, Switzerland, Hungary and in the USA we maintain subsidiaries, in 29 other countries SOLA is represented by strong sales partners. 75% of the products are manufactured at Götzis/ Austria. Here, at their head quarter, 200 employees develop, produce and distribute a product range of more than 1'500 articles. The high quality standards that SOLA has imposed on themselves are constantly monitored in SOLA own laboratories and test facilities.